FOR CHECK-IN and LINE UP. Please arrive no later than 11:15. GRADUATES WILL PROCESS FROM THE FRANCISCAN CENTER TO THE EBEID REC CENTER, beginning at 11:45 AM (rain or shine*). Due to limited seating at the Russell J. Ebeid Recreation Center for the Undergraduate Commencement exercises, TICKETS WILL BE REQUIRED FOR ALL GUESTS (including all children). GRADUATES WHO HAVE INDICATED THAT THEY WILL BE ATTENDING COMMENCEMENT WILL RECEIVE EIGHT TICKETS (no exceptions). Tickets will be available beginning May 7, 2019 in the Registrar’s Office (SCH 139). Graduates must pick up their tickets in person, and proof of identity at time of pick up will be required. Graduates may pick up only their own tickets. No replacements will be issued for lost or stolen tickets. All tickets must be picked up on or before Thursday, May 16. Tickets will not be available on May 17. BRING YOUR CAP, TASSEL**, GOWN, with you to the Franciscan Center Gym for line-up. Arrive no later than 11:15 AM. 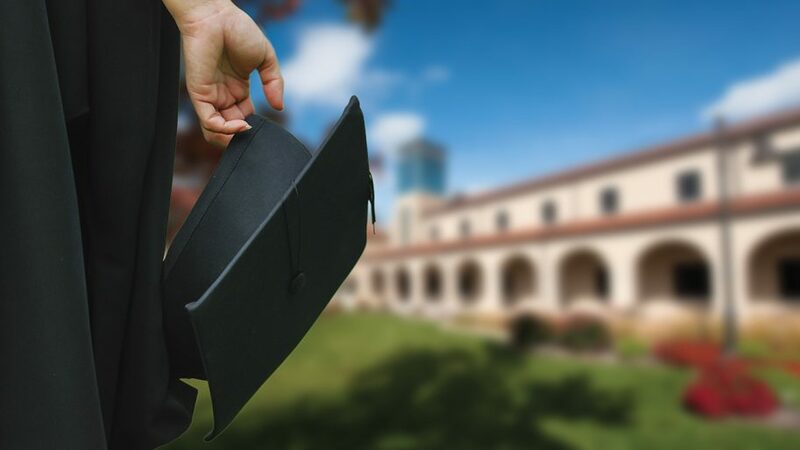 ** REMINDER: GOLD HONOR TASSELS are awarded to undergraduates only and MUST BE PICKED UP AHEAD OF TIME at the Registrar’s Office, beginning May 7, 2019. The Registrar’s Office will have the list of those who qualify for an Honors Tassel. * In the event of inclement weather, a contingency location for line-up will be at the Rec Center. An announcement will be made if the line-up location changes. Any graduate needing special accommodations for the procession and seating should contact Teddi Moorman at Lourdes as soon as possible at 419-824-3837. She will make arrangements to meet you and go through the details of using the accessibility ramp and going across the stage to receive your diploma. There will be limited accessible seating at the Rec Center. The Accessible Seating Desk will be in Rec Center Lobby. Guests needing to sit in the accessible area should check in at the desk to be shown to the accessibility section. PLEASE NOTE ACCESSIBLE SEATING IS LIMITED. ONLY TWO MEMBERS OF EACH FAMILY MAY SIT IN THE ACCESSIBILITY SECTION. Other family members may sit in other areas. This restriction is necessary to accommodate all the guests who need accessibility seating. 1. GRADUATES SHOULD REPORT TO THE FRANCISCAN CENTER GYM* for Check In and Line Up no later than 11:15 AM. Volunteers will be on hand to assist you. There will be tables located at the front of the gym (by the FC Commons doors). Guests are not permitted in the Gym for Line Up. 2. Leave your purse, coats, CELLPHONES and other belongings with family or friends. 3. Report to the table that has the first letter of your last name, i.e. A-E; F-J; K-P; Q -Z. 4. You will be given a card stating your name, college and the degree being awarded. The card will be color-coded to match the sign for your college in the line-up areas. Your college is listed on your card. Please write the phonetic spelling of your name on the space provided on the card when you check in. Report to the people stationed at your college sign in the line-up area. They will put you into the procession line-up. Please stay lined up inside the rope & stanchions until the procession begins. IMPORTANT: Because we do live diplomas, it is imperative that you stay in order. Please do not leave the lineup area once you have been placed to ensure that you receive the correct diploma! Keep your card with you at all times. You must take your card to the stage. You must hand your card to the person at the top of the stairs. Ushers will be on hand to help direct graduates to the appropriate assigned seat. Commencement programs for graduates will be available at the seat. Graduates should not carry anything during the procession except the information card handed to them at line-up. When graduates arrive in their seats, they remain standing until after the invocation and the National Anthem. Graduates will be asked to stand, by degree and college. After Dr. Gawelek confers the degrees, ushers will direct the graduates to the stairs at the right side of the stage. The rest of the degrees will follow in the same manner. Ushers will be at the bottom of the stairs to provide assistance. Candidates will move up the stairs to the stage, hand their pre-printed card (the one given out at line-up) to the person at the top of the stairs and proceed to shake hands with the Dean of the respective college. The graduate will continue across the stage and receive the diploma folder from Dr. Gawelek, and pose for a graduation photo. Graduates leave the stage by the stairs at the left. Graduates should return to the assigned seat and be seated. Once all degrees have been received, the Alumni Association President will give an Alumni welcome, followed by the benediction. University representatives will lead the singing of the Song of Lourdes (words and music will be in the program.) Dr. Gawelek will ask the graduates to stand and she will present the Graduating Class of 2019 to the audience. At this time, graduates will be instructed to move their tassels from the right side to the left side of the mortar board. It is essential that all graduates keep moving while leaving the auditorium in procession. Please do not stop in the reception area, otherwise an unsafe traffic jam will occur. Please ask your guests to remain seated until the procession is completed and then meet you outside the Rec Center, or in the Reception Area. 2018 Graduates will receive a congratulatory certificate in the diploma folder on graduation day. Spring 2019 graduates will receive the official Lourdes University diploma. Any issues regarding your diploma should be addressed to the Registrar’s Office (419-824-3817). Commencement will take place the Russell J. Ebeid Recreation Center and will last approximately 1-1/2 hours. Doors to the Rec Center will open at 11:15 a.m. ALL GUESTS ARE REQUIRED TO HAVE TICKETS (no exceptions). Each graduate will be allocated eight tickets. Families and guests should find seats in the gymnasium at this time. Limited special (accessible) seating including wheelchair access will be available. Guests needing special seating should arrive early and be seated by 11:45 when the doors to the Gymnasium will close for the graduate procession. Guests who arrive after 11:45 and need accessible seating will have to wait to be seated until after the graduates have processed. A NOTE ABOUT STROLLERS: NO STROLLERS ARE ALLOWED INSIDE THE GYMNASIUM. There will be a space allocated for strollers in the Welcome Area. Parking areas will be designated on campus. At approximately 11:45 a.m., the doors to the Rec Center will be closed to guests in order to facilitate the procession of graduates, faculty and staff. Please do not congregate around the procession area. Security personnel will be posted in this area to keep the aisles clear. Guests are asked to remain in their seats for the entire ceremony. The ceremony will last approximately 1-1/2.